Although much of the world is in a state of mourning over Tuesday's deadly Brussels attacks, not everyone has focused solely on showing signs of support and empathy for the people of Belgium. After all, it's an election year in the United States, so how could politicians running for president resist jumping into the fray and use it for their own (attempted) gains? Right after ISIS, President Obama was on the top of the hit list for GOP presidential contenders. 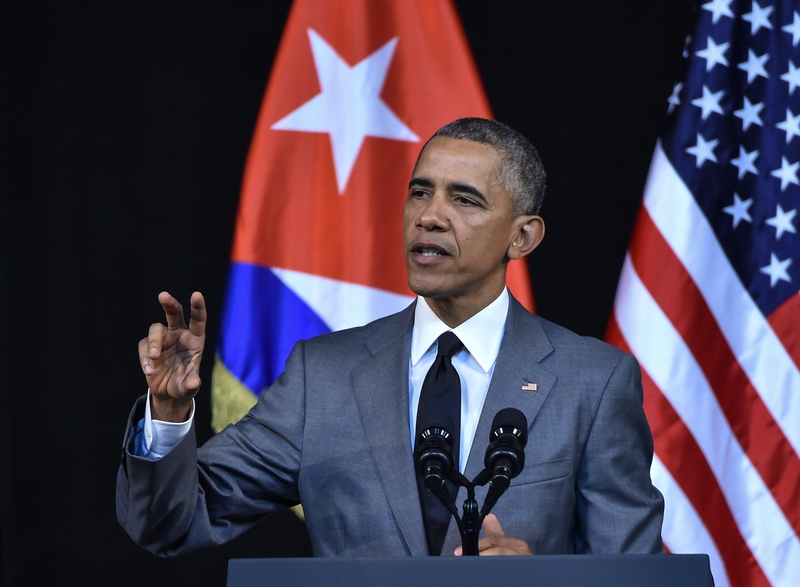 Obama faced heavy Republican criticism for staying in Cuba after the Brussels attacks. But was the president's decision to stay in Cuba the wrong move after a major act of terrorism? Republicans certainly thought so. Multiple candidates slammed Obama for remaining in Cuba. On Tuesday morning, Ohio Gov. John Kasich called out the president on Twitter, tweeting "The president must return home immediately and get to work with our allies to respond with strength against the enemies of the west." It was a point that Kasich hammered the president on again when he spoke on Fox Business. "He should come home," and "figure out exactly why we have these vulnerabilities," Kasich said in a phone interview. And of course, it would be impossible for The Donald to be silent on any issue, let alone one which allows him to take a nice swing at Obama. Trump tweeted that "Obama looks and sounds so ridiculous making his speech in Cuba, especially in the shadows of Brussels." These critiques of Obama are pretty transparent: They're looking for any way to spin a situation into making Obama look weak on foreign policy. Everything they say must be taken with a massive grain of salt. That being said, it doesn't look great that Obama spent only a relatively short time discussing the Brussels attacks on Tuesday. Yes, he took a strong stance, vowing, "We will do whatever is necessary to support our ally Belgium in bringing to justice those who are responsible." But there was something discordant about seeing him pivot into business as usual. In fact, the problem isn't just that it's business as usual: Obama attended a scheduled baseball game between the Cuban national team and the Tampa Bay Rays. While the game was a key part of his Cuban tour, attending such a lighthearted, fun event seemed like a bad choice as Europe reeled from the growing death toll. It's hard to know whether leaving Cuba would have enabled Obama to make more efficient or better decisions to reach out to Belgian leaders and other European officials during this time of mourning and crisis. During the London bombings on July 7, 2007, President George W. Bush happened to already be at Group of Eight summit, so the travel and logistical decisions were non-issues, and it's hardly clear that any great developments occurred because Bush was there, as opposed to in the United States or anywhere else. Still, it doesn't send a good message domestically or internationally to see splashy photos of Obama at a baseball game as images of the Belgian wreckage spread across the web. Maybe Obama should have benched this part of his trip.